All this is leading to a fun new widget that I've developed, my 2020 modeler. Trump has proven to be every bit as awful as his worst critics have supposed, and in the 2+ years that he's squatted in the White House, we've all been filled with a sense of dread that he'll never leave. So with that in mind, I've pulled together some numbers to realistically assess our best strategy for getting a Dem in there and undoing some of the damage that Trump has inflicted on the country. But first, a little Q&A about incumbency and reelection. Question 1: Don't Incumbents just always get reelected? I have a little game I’d like to play with you. 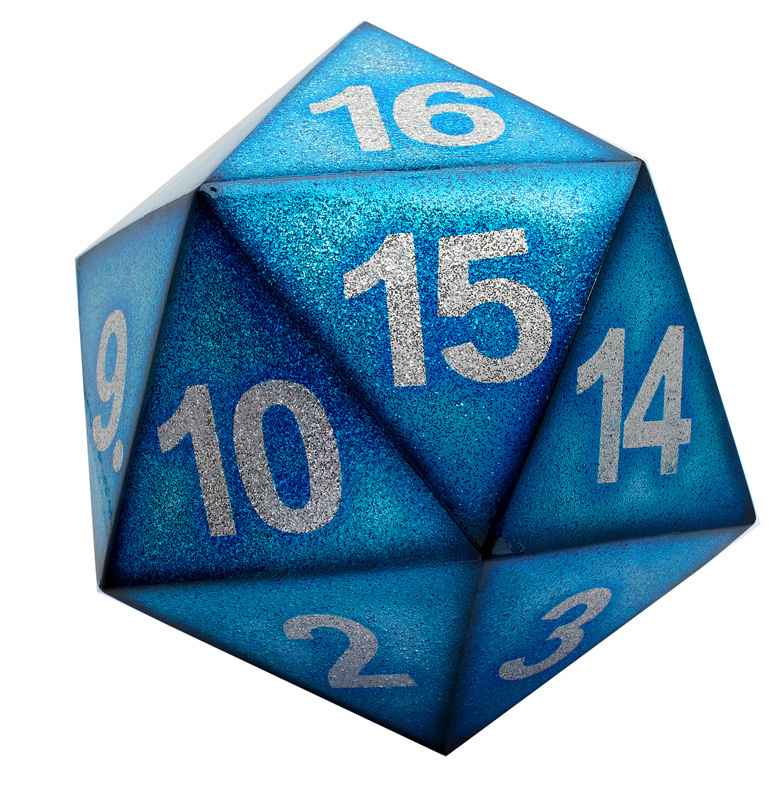 You and I each sit down with a 20-sided dice. 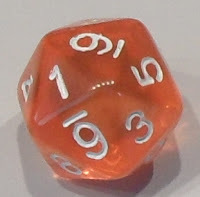 My roll represents the strength of the Dems choosing a candidate, and yours represents the Republicans. 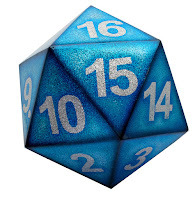 Whoever rolls a higher number "wins," and their candidate goes on to be president. Say you role a 16 and I roll a 9. You win and we get a Republican president. President Initial Election Reelection year Successful? *Carter defeated Ford, who wasn't actually elected in the first place. Three of eight did worse the second time around, and the average improvement was only 1.6% – quite consistent statistically from no change at all. The bottom line is that the only reason we tend to think that incumbents are in strong positions to be reelected, is because they were strong enough to be elected in the first place, and in the case of Trump, who won despite losing the popular vote, had help from Comey and the Russians, drew an inside straight on a bunch of key states, it's not obvious that he's more than a 5 or 6 on our hypothetical 20-sided die. Question 2: Does popularity matter? Much of the handwringing around the election focuses on the electability of the Democratic candidate, and while we can't ignore that, it's probably best to note that, to leading order, the election is going to be referendum on Trump. That's very good news as the guy is very unpopular. To give you a sense of how much approval matters, I've taken the net approval ratings (from fivethirtyeight, the value is taken for the end of October in all cases) for the last eight presidents to run for reelection and compared them to their popular vote margins. The two with negative net approvals (Carter and Bush) lost the popular vote and also failed to get reelected, and everyone else, with a positive, succeeded. There's a pretty clear trend. 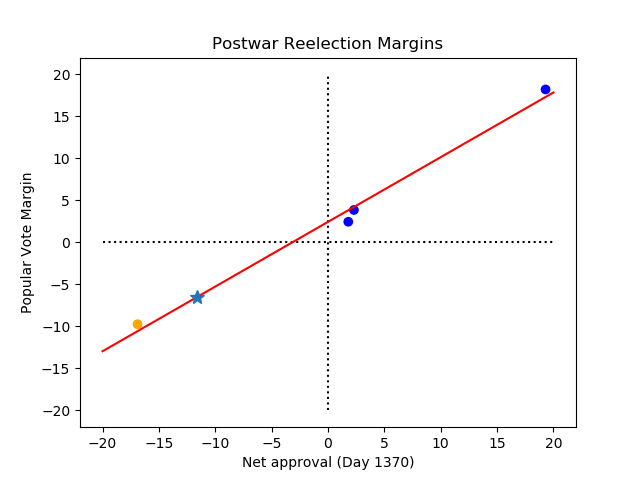 Trump's current net approval, by my estimate, has been insanely stable, and currently stands at around -11.6, yielding an estimate of Trump losing by 6.9 points in the popular vote if the election were held tomorrow. There are loads of caveats. For one thing, no model is perfect. For another, the election won't be held tomorrow, and he could improve his standing between now and then – though he has never actually been popular where his approvals would have suggested reelectability. There's also the small issue of the electoral college versus popular vote, and Trump once again could win the former but lose the latter. Hard to imagine that happening, though, with a 7 point margin. Question 3: This far out, how do "undecideds" end up? Trump's unpopularity is only one side of the equation. The other is the popularity of the Democratic challenger. One of the many post-hoc explanations of 2016 is that Hillary was very unpopular, so Trump's terribleness wasn't sufficient to lose him the election (never mind that she won by 3 million votes, the Russian interference, and... I'm not doing this now). I should note that each of these are based on only 4 polls, and we're still a long way out, but on the other hand, there's an important difference between the two. Biden was a popular Vice President for 8 years, while Warren is a senator, and has been continuously maligned by Trump and others. But there's another important difference. So far, in the Warren matchup, 9.2% of voters are undecided, but only 6.6% with Biden. With Harris, it's 10.2%. The point is that the larger the number of undecideds at this stage, the more uncertainty as to where they'll land, but it seems reasonable (even if it ends up not being correct) to suppose that if there's a lot of undecideds now, a larger fraction are going to support the challenger as we get closer to the election. 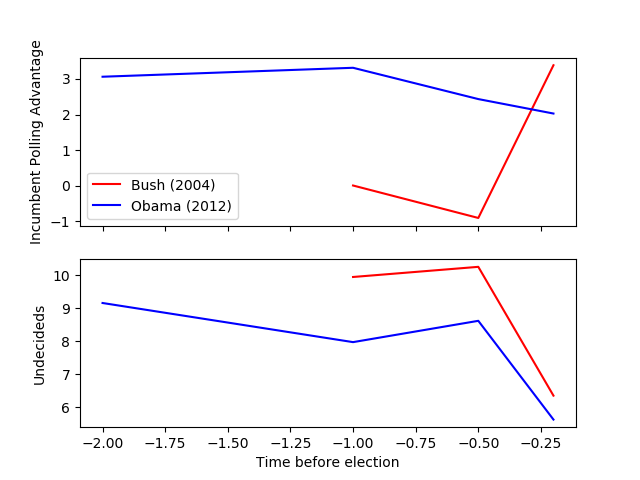 In both of the last two elections, the number of undecided voters decreased precipitously as the election approached. But in 2012, more of those voters (by a small margin) went to the challenger, and in 2004, more went to the incumbent. 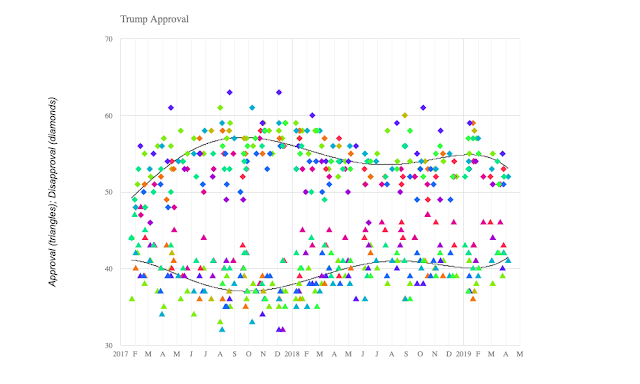 This is further confused by the fact that Obama's net approval generally improved in the last year and a half of his first term, while W remained largely flat (to decreasing) over the same term. I think it would be tough to draw any general conclusions. Question 4: So what can we say now? You select a candidate from a list in the upper left. 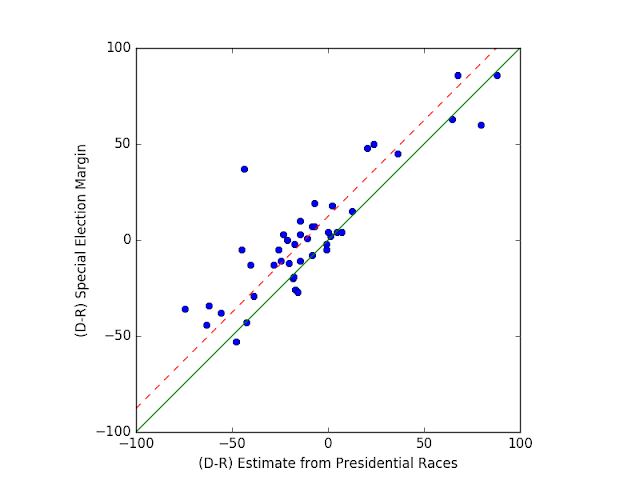 Using approval polls, state polls, and national polls from highly rated pollsters (B- or better, according to 538's ratings), it estimates the probability and margin of the candidate winning each state. 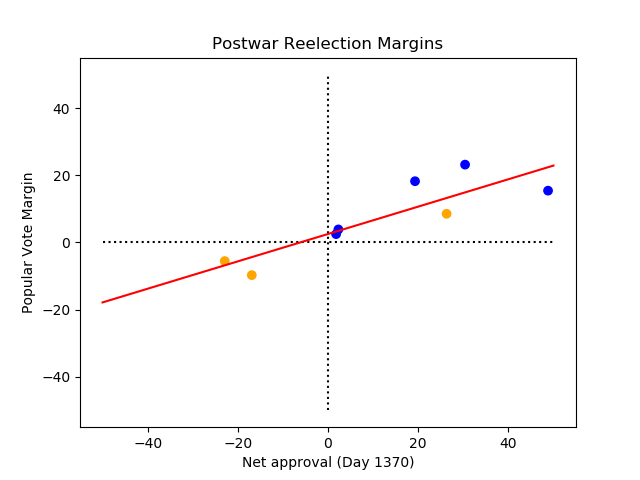 Using that model, as well as the uncertainty that polling may be systematically off, it runs a few thousand simulated elections, and figures out what fraction of the time a particular candidate will win. You can adjust values like whether you think there's a likely overall bias, whether undecideds will swing toward Trump or the Dem challenger and so on. States without polling are basically determined by starting with the 2016 results, and then adding or subtracting based on the national estimate. If the national estimate puts the Dem up by 2.1 (same margin as Hillary) then our best guess is that the state will be the same as in 2016. 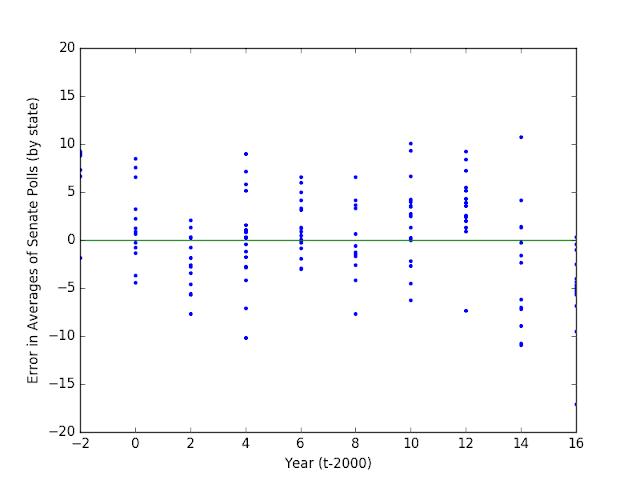 If, on the other hand, there is polling, then that tends to dominate the estimate. 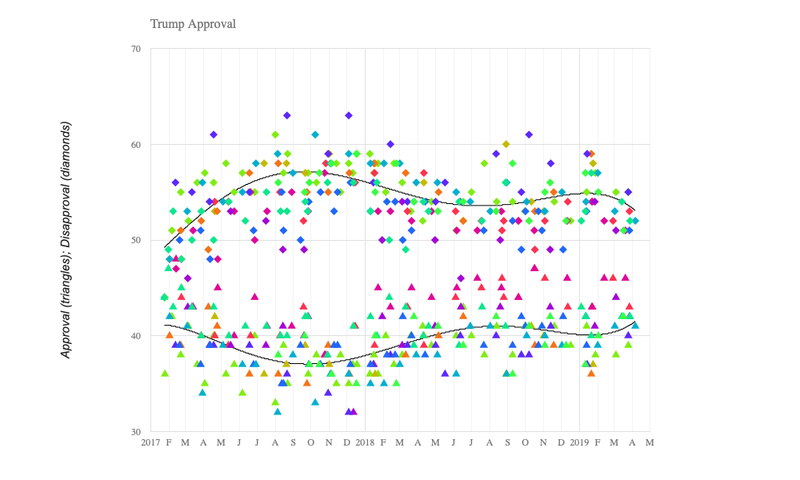 Nationally, we start with the estimate from Trump's approval rating (Q2 above), and then weigh in national polls. However, as with my House modeling last year, if individual state polls predict an improvement or decline compared to 2016, then those get weighted appropriately into the overall national estimate. Remember, these are only as the polls are today, but it is worth noting that a handful of candidates do significantly better than you might have guessed even based on Trump's abysmal polling. Also, as candidates surge (and are thus included in more head-to-head polling), I'll be sure to add them to the list.